Qantas this week is celebrating the 60th anniversary of its commencement of first trans-Pacific services between Australia and the USA. The first service – on May 15 1954 – was operated by a Lockheed Super Constellation which flew from Sydney to San Francisco via Fiji, Canton Island and Hawaii, before proceeding on to Vancouver. The flight took about 30 flying hours compared to less than half that today. The trans-Pacific route is named the Southern Cross Route in honour of Sir Charles Kingsford Smith and his crew’s famous aircraft which first crossed the Pacific in 1928. 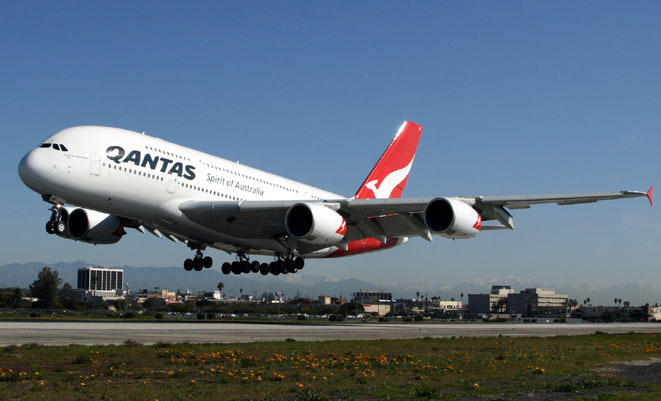 Today, Qantas operates daily A380 services Sydney-Los Angeles (QF11/12) and Melbourne-Los Angeles (QF94/95), a daily 747-400 Sydney-LA-New York service (QF107/108), daily Brisbane-Los Angeles 747-400 flights (QF15/16), a daily 747-400ER service between Sydney and Dallas-Fort Worth, returning via Brisbane (QF7/8), and three flights a week between Sydney and Honolulu using 767-300ERs (QF3/4). The Sydney-Dallas-Fort Worth service is due to be up-gauged to a six-times-a-week A380 from September 29 with the return Brisbane stop to be dropped. Shame Qantas doesn’t still fly to/from San Francisco or Vancouver and even a few more north American points. I suppose it’s the same for passengers on foreign airlines which fly only to Sydney – lots of connections to get somewhere interesting. it will all be down to depart times from SYD and arrival times into LAX. Well Done again for 60 years of Pacific flying. Sad that QF isn’t as innovative and pioneering with their routes and destinations today as they were back then. Their financials may be somewhat in better shape if they were. Pity QANTAS hasn’t invited the HARS Connie to help celebrate the anniversary since it was this aircraft type which commenced the service. The photo’s caption seems wrong. The flaps are extended for landing. Thanks Geoff, caption has been amended.